We’ve been waiting for it and now it is here! 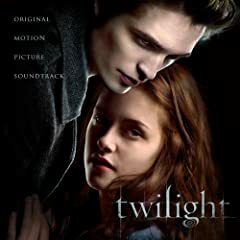 If you are like me and are too impatient to wait for a copy of the CD, you can get the entire Twilight Original Movie Soundtrack from iTunes for $11.99. The only song available for individual purchase is Paramore’s Decode, the first officially released song from the CD. If you would rather have the Twilight CD itself, you can order it from Amazon for $9.99 and you should have it in a few days. If you don’t place an order for $25 or more, you will have to pay shipping. I’ll be anxious to hear from those of you who have it! the soundtrack is amazing!!! I love it and Edwards voice will totally surprise you if you haven’t heard it b4! oops didn’t mean to submit twice i love edward!!!!!!!!!! Haven, seen movie, but the books,at least the ones I’ve read, are the best.I’ve only rea the first 2.